According to the Miami Herald’s Barry Jackson, it is “far from certain” that 2016 third-round WR Leonte Carroo even makes the Dolphins’ 53-man roster. 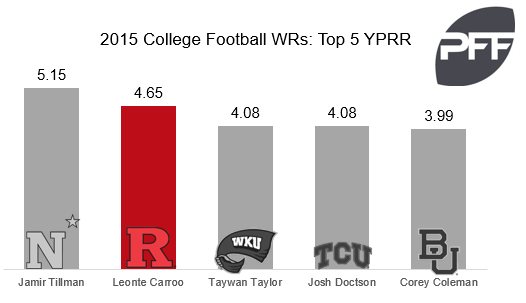 Last season, had Carroo’s overall grade of 54.9 qualified, he would have ranked 97th out of 115 receivers. It was a small sample size, as he was only targeted six times last year, but Carroo’s passer rating when targeted of 63.5 ranked him 157th out of 202 receivers. Although he did miss some time in his final college season due to injuries, in 2015, among qualified receivers, Carroo ranked second in the country in yards per route run with 4.65.